..please be patient... this page with its large map needs some time to load..
ABOUT SEULAWAH AGAM (: (GVP/ Smithsonian institute/ USGS:Seulawah Agam at the NW tip of Sumatra is an extensively forested volcano of Pleistocene-Holocene age constructed within the large Pleistocene Lam Teuba caldera. A smaller 8 x 6 km caldera lies within Lam Teuba caldera. The summit contains a forested, 400-m-wide crater. The active van Heutsz crater, located at 650 m on the NNE flank of Suelawah Agam, is one of several areas containing active fumarole fields. Sapper (1927) and the Catalog of Active Volcanoes of the World (CAVW) reported an explosive eruption in the early 16th century, and the CAVW also listed an eruption from the van Heutsz crater in 1839. Rock et al. (1982) found no evidence for historical eruptions. However the Volcanological Survey of Indonesia noted that although no historical eruptions have occurred from the main cone, the reported NNE-flank explosive activity may have been hydrothermal and not have involved new magmatic activity. CVGHM reported that visual observations of Seulawah Agam during 27 December-2 January seismicity increased. Visual observations were prevented due to fog, although on 2 January scientists observed a new solfatara that produced roaring noises and was within 20 m of van Heutsz Crater on the NNE flank. The Alert Level was raised to 2 (on a scale of 1-4) on 3 January. 2013 JAN- 03 JAN- 08? 20141230/ note: This project was part of my solar and terrestrial blog related to the peak of the 26. 11 year sun spot cycle in 2013 . Due to the decreasing sun spot activity now, also volcanic activity updates in my volcano maps were cancelled in July 2014. READ ABOUT THE GOOGLE EARTH FEATURE: this column contains Google Earth program orders: click on one of the names and Google Earth will open and automatically navigate to the coordinates of that specific volcano on Google Earth! Google Earth programs tips: If google Earth does that too slowly, you can increase that" navigations speed" as follows: Use the menu on top of your Google Earth program window : There, open one after another the register cards for >" tools" > options > navigation. on the navigation card you find te controller for " apporach speed ( deutsch: Anflugsgeschwindigkeit) Just increase the approach speed there as intended. Possibly you have to close and reopen Google Earth afterwards, that these changes ind the function take place! NOTES: To use this "find with Google" feature, you must have installed Google Earth. There is no problem known: Nevertheless, the use of Google Earth as well as the use of all feature on alien-homepage.de is on your own risk. local links> Badan Geology/ Indonesia gov. links> Badan Geology/ Indonesia gov. local references> Badan Geology/ Indonesia gov. INDONESIA`S RECORD OF BEING THE PLANETS EPICENTER Nr 1.
date event strength depth location/ specifics long./lat. 2010-10-25 14:42 UTC SEAQUAKE M 7.7 10 km KEP. MENTAWAI REGION, INDONESIA 3.46 S ; 100.12 E Seaquake- 2010 10 25-M 7.7 - KEP. MENTAWAI R.- IND. first eruption occured on OCT- 26- 2010: Residents on the islands reported, they had to climb on trees "as the asphalt under their feeds was cooking". Since then, Merapi had several extreme eruption along with pyroclastic clouds rushing down with 400 km/h its slopes, killing everything on their way. 35 = volcano + number). You find the name of the volcano and all infos in the register card! date event strength depth location/ EMSC datalink long./lat. see also: registercard "Indonesia- epicenter of the planet" on the right bottom of this page ! PVMBG reported that Merapi observers at the Ngepos post noted white plumes rising 300 m above the lava dome on 15 April. Seismicity increased during 18-20 April. During 0426-0440 on 20 April an explosion occurred and rumbling was heard in areas as far as 8 km away. Ash plumes were observed from some observations posts, but foggy conditions prevented views from others. Based on satellite images and wind data, the Darwin VAAC reported that an ash plume rose to an altitude of 10.7 km (35,000 ft) a.s.l. and drifted 260 km WNW. PVMBG noted that ashfall was reported in areas within 15 km S, SW, and W. The Alert Level remained at 1 (on a scale of 1-4). 2013 NOV- 18 NOV- 19? According to news articles, a phreatic eruption at Merapi on 18 November produced an ash plume that rose 2 km above the crater and caused ashfall in areas as far as 60 km E. About 600 families from the Glagaharjo village gathered at evacuation assembly points, while others on the W flank evacuated then returned to their homes hours later. 2013 JULY 22 JULY- 30? Balai Penyelidikan dan Pengembangan Teknologi Kegunungapian (BPPTK) reported that at 0415 on 22 July a booming sound from Merapi was followed by a rising plume observed from multiple observation posts. Ashfall was reported in areas S, including Kaliurang and Balerante. The Alert Level remained at 1 (on a scale from 0-4). According to news articles, the eruption lasted until about 0530, and generated a dense black plume that rose 1 km. A booming sound was heard 30 km away. Ashfall affected the district of Deles, Tlogowatu, Kemalang, Balerante, Klaten, and Jawa Tengah. Hundreds of residents evacuated but returned to their homes later that day. 2011 DEC- 12 DEC- 13? CVGHM reported increased seismicity from Merapi during 1-12 December and white plumes rose 40-50 m above the summit. CVGHM raised the Alert Level on 12 December from 1 to 2 (on a scale of 1-4) based on seismic data. 2011 SEP- 08 SEP- 13? CVGHM reported that the Alert Level for Merapi was lowered to 2 (on a scale of 1-4) on 9 January. During 10-16 January seismicity had decreased compared to the previous week. Gas plumes rose from the crater; on 11 January gas plumes rose to a maximum height of 80 m above the crater. On 12 January avalanches descended the Krasak drainage, traveling 1.5 km SW. Lahars and high water during 15-23 January damaged infrastructure and caused temporary road closures. On 22 January plumes rose 175 m above the crater and drifted E.
According to a news article, lahars on Merapi's flanks that occurred on 3 and 9 January caused damage to houses, farms, and infrastructure in multiple villages in the Magelang district, 26 km WNW of Merapi. One death and one injury were reported. On 9 January, the Red Cross evacuated people trapped in their homes in the Sirihan village. An estimated 3,000 people live in the flooded area, but the number of people evacuated was unknown. << webcams are sometimes DOWN! ABOUT SORIKMARAPI : (Geologic Summary by global volcanism program( Smithsonian inst): Sorikmarapi is a forested stratovolcano with a 600-m-wide summit crater containing a crater lake and substantial sulfur deposits. A smaller parasitic crater (Danau Merah) on the upper SE flank also contains a crater lake; these two craters and a series of smaller explosion pits occur along a NW-SE line. Several solfatara fields are located on the eastern flank. Phreatic eruptions have occurred from summit and flank vents during the 19th and 20th centuries. 2011 DEC- 05 JAN- 03- 2012? CVGHM reported increased seismicity from Sorik Marapi during 1-12 December and white plumes rose 40-50 m above the summit. CVGHM raised the Alert Level on 12 December from 1 to 2 (on a scale of 1-4) based on seismic data. PHIVOLCS reported that the Alert Level for Bulusan was lowered to 0 (on a scale of 0-5) on 24 April following a decline in activity after a phreatic eruption on 13 May 2011. The frequency of earthquakes decreased to baseline levels of 0-2 per day, measurements indicated deflation since late November 2011, and steaming activity from the crater and known thermal vents had been frequently weak compared to more moderate steam emissions during periods of unrest. Entry into the permanent danger zone, defined by a 4-km radius around the volcano, remained prohibited. On 13 May, PHIVOLCS reported that an explosion from Bulusan's summit crater was accompanied by a rumbling sound audible up to 5 km away. The event was recorded by the seismic network as an explosion-type earthquake lasting for about 10 minutes. Cloud cover prevented observations of the summit area. Field investigation conducted immediately after the explosion confirmed the presence of thin ash deposits (0.5- 2.5 mm) approximately 9 km away from the crater in the NW and SW sectors. Several barangays in the municipalities of Juban and Irosin reported light ashfall. The Alert Level remained at 1 (on a scale of 0-5). Entry into the permanent danger zone, defined by a 4-km radius around the volcano, was prohibited. During 15-16 May the seismic network detected four earthquakes. Then, on 16 May, the number of earthquakes rapidly increased to 80 in a seven-hour period. On 17 May PHIVOLCS reported that 144 earthquakes were recorded in the previous 24 hours. Steam rose from the active vents. 2011 APR- 11 APR- 26? Based on notices from the Manila airport (RPLL), the Tokyo VAAC reported that ash from Bulusan was observed during 7-8 and 11 April. Plumes drifted W on 7 April, and NW and SW on 11 April. PHIVOLCS reported that during breaks in the clouds on 7 April steam plumes were observed rising from the SE and NW thermal vents. During 4-10 January, PHIVOLCS reported that 2-8 daily volcanic earthquakes at Bulusan were detected by the seismic network. Clouds usually prevented observations, but on 5 or 6 January steam was seen rising from a known NW thermal vent. The Tokyo VAAC reported that on 6 and 7 January ash was observed according to notices from the Manila airport (RPLL). The Alert Level remained at 1 (on a scale of 0-5). ABOUT TAAL: (Geologic Summary by global volcanism program( Smithsonian inst): . Taal volcano is one of the most active volcanoes in the Philippines and has produced some of its most powerful historical eruptions. In contrast to Mayon volcano, Taal is not topographically prominent, but its prehistorical eruptions have greatly changed the topography of SW Luzon. The 15 x 20 km Taal caldera is largely filled by Lake Taal, whose 267 sq km surface lies 700 m below the S caldera rim and only 3 m above sea level. The maximum depth of the lake is 160 m, and several eruptive centers lie submerged beneath the lake. The 5-km-wide Volcano Island in north-central Lake Taal is the location of all historical eruptions. The island is a complex volcano composed of coalescing small stratovolcanoes, tuff rings, and scoria cones that has grown about 25% in area during historical time. Powerful pyroclastic flows and surges from historical eruptions of Taal have caused many fatalities. 2011 May- 26 July- 05? 2011 APRIL- 05 eruptive APR- 26? PHIVOLCS reported that field observations of Taal conducted at the E sector inside the main crater lake on 5 April 2011 showed that steaming at the thermal area was weak. The water level had receded 3 mm and the water temperature slightly increased from 30 to 30.5 degrees Celsius. Since the previous measurement on 29 March, the pH value increased indicating that the water had become slightly less acidic. Gas measurements conducted last January, February, and March yielded carbon dioxide emission values (in tonnes per day) of 2,250, 1,875, and 4,670, respectively. On 9 April PHIVOLCS noted that after 31 March the number of earthquakes gradually rose and the depths become more shallow (1-4 km). Steaming at the N and NE sides of the main crater occasionally intensified and was occasionally accompanied by hissing sounds. The Alert Level was raised to 2 (on a scale of 0-5) because of increased seismicity and carbon dioxide emissions. PHIVOLCS warned tourists and residents to avoid Volcano Island. According to news articles, about 100 families had volunteered to evacuate; about 7,000 people remained. ABOUT TANGKUBANPARAHU : ( Geological summary by global volcanism program/ Smithsonian/USGS:Tangkubanparahu is a broad shield-like stratovolcano overlooking Indonesia's former capital city of Bandung that was constructed within the 6 x 8 km Pleistocene Sunda caldera. The volcano's low profile is the subject of legends referring to the mountain of the "upturned boat." The rim of Sunda caldera forms a prominent ridge on the western side; elsewhere the caldera rim is largely buried by deposits of Tangkubanparahu volcano. The dominantly small phreatic historical eruptions recorded since the 19th century have originated from several nested craters within an elliptical 1 x 1.5 km summit depression. Tangkubanparahu last erupted in September 1983, when ash rose up to 150 m above the rim of Kawah Ratu. 2013 OCT- 05 OCT- 29? CVGHM reported that phreatic eruptions from Tangkubanparahu's Ratu Crater occurred on 28 February and during 4-6 March, and generated ash plumes that rose up to 100 m above the crater. Sulfur dioxide emissions increased to a high level on 24 February and then decreased through 3 March. Sulfur dioxide emissions again increased during 5-9 March; CVGHM speculated that the increase was due to an enlargement of the eruptive vent, which had grown to a diameter of 20 m. Gas emissions decreased abruptly on 10 March and emission sounds stopped. Seismicity had significantly increased on 22 February, marked by a growing number of daily events. A significant decrease was detected on 9 March. Deflation was detected from 24 February through early March, but was then stable during 7-14 March. On 18 March the Alert Level was lowered to 1 (on a scale of 1-4). 2013 MAR- 04 MAR- 19? 2013 FEB- 21 FEB- 26? ABOUT RAUNG: (GVP/ Smithsonian institute/ USGS: Raung, one of Java's most active volcanoes, is a massive stratovolcano in easternmost Java that was constructed SW of the rim of Ijen caldera. The 3,332-m-high, unvegetated summit of Gunung Raung is truncated by a dramatic steep-walled, 2-km-wide caldera that has been the site of frequent historical eruptions. A prehistoric collapse of Gunung Gadung on the W flank produced a large debris avalanche that traveled 79 km from the volcano, reaching nearly to the Indian Ocean. Raung contains several centers constructed along a NE-SW line, with Gunung Suket and Gunung Gadung stratovolcanoes being located to the NE and W, respectively. 2012 OCTOBER 17 OCT- 23? ABOUT PAPANDAYAN: gelogic summary by Smithsonian inst./ USGS: Geologic Summary. Papandayan is a complex stratovolcano with four large summit craters, the youngest of which was breached to the NE by collapse during a brief eruption in 1772 and contains active fumarole fields. The broad 1.1-km-wide, flat-floored Alun-Alun crater truncates the summit of Papandayan, and Gunung Puntang to the N gives the volcano a twin-peaked appearance. Several episodes of collapse have given the volcano an irregular profile and produced debris avalanches that have impacted lowland areas beyond the volcano. Since its first historical eruption in 1772, in which a catastrophic debris avalanche destroyed 40 villages, only two small phreatic eruptions have occurred from vents in the NE-flank fumarole field, Kawah Mas. 2013 MAY- 01 MAY- 07? 2012 JAN- 31 FEB- 07? 2011 AUG- 26 AUG- 30? Based on analyses of satellite imagery and wind data, the Darwin VAAC reported that during 10-13 and 15 April ash plumes from Dukono rose to altitudes of 1.8-2.4 km (6,000-8,000 ft) a.s.l. and drifted 75-280 km SE and E.
2013 DEC- 18 April 01? Based on analyses of satellite imagery and wind data, the Darwin VAAC reported that on 18 December a possible ash plume from Dukono rose to an altitude of 2.1 km (7,000 ft) a.s.l. and drifted over 35 km E. On 24 December an ash plume rose to an altitude of 3 km (10,000 ft) a.s.l. and drifted 55 km N.
Based on analyses of satellite imagery and wind data, the Darwin VAAC reported that on 17 September an ash plume from Dukono rose to an altitude of 3 km (10,000 ft) a.s.l. and drifted 45 km NE. Based on analyses of satellite imagery and wind data, the Darwin VAAC reported that on 29 August and during 31 August-3 September ash plumes from Dukono rose to altitudes of 2.4-3 km (8,000-10,000 ft) a.s.l. and drifted 80-240 km W and NW. Based on analyses of satellite imagery, the Darwin VAAC reported that on 18 June an ash plume from Dukono rose to an altitude of 3 km (10,000 ft) a.s.l. and drifted 110 km W. An ash plume rose to an altitude of 3 km (10,000 ft) a.s.l. and drifted almost 85 km W on 19 June. 2012 JAN- 30 FEB. 07? Based on analyses of satellite imagery, the Darwin VAAC reported that during 30-31 January ash plumes from Dukono rose to an altitude of 2.7 km (9,000 ft) a.s.l. and drifted 220 km SW.
Based on analyses of satellite imagery, the Darwin VAAC reported that during 18-21 August ash plumes from Dukono rose to an altitude of 3 km (10,000 ft) a.s.l. and drifted 110-150 km NE and N.
According to a news article, activity at Dukono has continued to increase. On 11 August ash explosions were audible within a radius of about 7 km from the base of the volcano. Ash was ejected as high as 1 km above the crater, producing plumes that drifted E and S, and also approached Tobelo City (14 km ENE). Seismographs at the Dukono observation post recorded more than 100 eruption earthquakes. Based on analyses of satellite imagery, the Darwin VAAC reported that on 11 and 14 August ash plumes rose to an altitude of 3 km (10,000 ft) a.s.l. and drifted 93 km NW. 2011 JULY- 01 July- 12? Based on analyses of satellite imagery, the Darwin VAAC reported that on 1 July an ash plume from Dukono rose to an altitude of 3 km (10,000 ft) a.s.l. and drifted 110 km E.
2011 JUN E- 01 June- 07? Based on analyses of satellite imagery, the Darwin VAAC reported that on 1 June an ash plume from Dukono rose to an altitude of 3 km (10,000 ft) a.s.l. and drifted 110 km NE. 2011 APRIL 21 MAY- 24? Based on analyses of satellite imagery, the Darwin VAAC reported that during 21-22 April ash plumes from Dukono rose to an altitude of 2.1 km (7,000 ft) a.s.l. and drifted less than 85 km NE and E.
2011 APR- 04 APR- 05? Based on analyses of satellite imagery, the Darwin VAAC reported that on 4 April an ash plume from Dukono rose to an altitude of 2.4 km (8,000 ft) a.s.l. and drifted 185 km E.
Based on analyses of satellite imagery, the Darwin VAAC reported that during 5-7 January ash plumes from Dukono rose to altitudes of 2.4-3.7 km (8,000-12,000 ft) a.s.l. and drifted 65-130 km W.
ABOUT BARREN ISLANDS : (Geologic Summary by global volcanism program( Smithsonian inst):Barren Island, a possession of India in the Andaman Sea about 135 km NE of Port Blair in the Andaman Islands, is the only historically active volcano along the N-S-trending volcanic arc extending between Sumatra and Burma (Myanmar). The 354-m-high island is the emergent summit of a volcano that rises from a depth of about 2250 m. The small, uninhabited 3-km-wide island contains a roughly 2-km-wide caldera with walls 250-350 m high. The caldera, which is open to the sea on the west, was created during a major explosive eruption in the late Pleistocene that produced pyroclastic-flow and -surge deposits. The morphology of a fresh pyroclastic cone that was constructed in the center of the caldera has varied during the course of historical eruptions. Lava flows fill much of the caldera floor and have reached the sea along the western coast during historical eruptions. 2014 Feb- 06 FEB 11? 2013 OCT- 17 OCT- 29? ABOUT ILIWERUNG : (Geologic Summary by global volcanism program( Smithsonian inst):Constructed on the southern rim of the Lerek caldera, Iliwerung forms a prominent south-facing peninsula on Lembata (formerly Lomblen) Island. Craters and lava domes have formed along N-S and NW-SE lines on the complex volcano; during historical time vents from the summit to the submarine SE flank have been active. The Iliwerung summit lava dome was formed during an eruption in 1870. In 1948 Iligripe lava dome grew on the eastern flank at 120 m altitude. Beginning in 1973-74, when three ephemeral islands were formed, submarine eruptions began on the lower SE flank at a vent named Hobal; several other eruptions took place from this vent before the end of the century. 2013 SEP- 03 SEP- 04? CVGHM reported that observers at a post 6 km away from Iliwerung reported that diffuse fumarolic emissions from the crater were visible during the mornings from 19 August to 1 September. Seismicity decreased on 19 August and remained at normal levels. On 2 September the Alert Level was lowered to 1 (on a scale of 0-4). 2013 AUG 19 AUG- 20? CVGHM reported that observers at a post 590 m a.s.l. and 6 km away from Iliwerung reported that diffuse fumarolic emissions from the crater were visible during the mornings from 1 to 19 August. Seismicity fluctuated during the month, but 81 shallow volcanic earthquakes were detected between 1606 and 1741 on 19 August, compared to a total of 30 the previous 18 days. The Alert Level was raised to 2 (on a scale of 0-4). At 0714 on 20 August an eruption from the submarine SE flank vent, Hobal, ejected dense white plumes 2 km a.s.l. that drifted S. Incandescence at sea level was observed at 0746, and the water around the eruption site turned yellow. Fishermen and tourists were not permitted within a 2-km-radius of Hobal. last known previous activity: THERE IS NO RECORD. ABOUT GAMKONORA : (Geologic Summary by global volcanism program( Smithsonian inst): . The shifting of eruption centers on Gamkonora, at 1635 m the highest peak of Halmahera, has produced an elongated series of summit craters along a N-S trending rift. Youthful-looking lava flows originate near the cones of Gunung Alon and Popolojo, south of Gamkonora. Since its first recorded eruption in the 16th century, Gamkonora has typically produced small-to-moderate explosive eruptions. Its largest historical eruption, in 1673, was accompanied by tsunamis that inundated villages. 2013 MAY- 23 MAY- 29? 2011 APRIL- 29 eruptive MAY- 04? ABOUT LOKON EMPUNG : ( Geological summary by globyl volcanism program/ Smithsonian/USGS: The twin volcanoes Lokon and Empung, rising about 800 m above the plain of Tondano, are among the most active volcanoes of Sulawesi. Lokon, the higher of the two peaks (whose summits are only 2.2 km apart) has a flat, craterless top. The morphologically younger Empung volcano has a 400-m-wide, 150-m-deep crater that erupted last in the 18th century, but all subsequent eruptions have originated from Tompaluan, a 150 x 250 m wide double crater situated in the saddle between the two peaks. Historical eruptions have primarily produced small-to-moderate ash plumes that have occasionally damaged croplands and houses, but lava-dome growth and pyroclastic flows have also occurred. 2013 SEP- 09 SEP- 10? 2013 APRIL 03 APR- 23? 2013 MAR- 26 MAR- 26? 2013 JAN- 08 FEB- 05? 2012 NOV- 11 DEC- 19? 2012 Oct- 06 Oct- 09? 2012 Sep- 15 - SEP- 25? 2012 FEB- 10 FEB 14? 2011 DEC- 27 JAN- 03- 2012? 2011 OCT- 26 NOV- 03? 2011 OCT- 11 Oct- 17? 2011 AUG- 28 AUG- 30? 2011 FEB- 23 March- 01? 2013 MAY- 30 JUNE- 11? PHIVOLCS reported that during 30-31 May diffuse, short-lived, bluish, hydrogen sulfide emissions rose from Mayon, and incandescence from the crater was observed. Sulfur dioxide emissions fluctuated between 5 and 388 tonnes per day, remaining below the normal level of 500 tonnes per day. Seismicity was low, while a recently concluded ground deformation survey indicated slight inflation compared to February survey data. Based on the visual observations, and despite that most monitoring parameters remained within baseline levels, PHIVOLCS raised the Alert Level to 1 and reminded the public not to enter the 6-km-radius Permanent Danger Zone (PDZ). 2013 MAY 07 MAY- 14? PHIVOLCS reported that a small phreatic eruption from Mayon occurred at 0800 on 7 May and lasted for 2 minutes and 26 seconds. A gray-to-brown ash cloud rose 500 m above the crater and drifted WSW. Ash fell in areas WNW, affecting the barangays of Muladbucad (10 km WSW), Guinobatan (11 km SW), Nabonton (10 km W), Nasisi (11 km W), Basag (10 km W), Tambo, Ligao City (19 km WSW), Albay (19 km SW), and areas upslope of these barangays. One rockfall was detected. Seismicity and gas emissions remained within background levels and indicated no intensification of activity. The Alert Level remained at 0 and the public was reminded not to enter the 6-km-radius Permanent Danger Zone (PDZ). According to a news article, the eruption ejected large "room-sized rocks" towards about 30 climbers, killing five and injuring eight. PHIVOLCS reported that a deformation survey of Mayon conducted during 31 May-4 June showed slight inflation since a 6-10 March survey. White steam emitted from the summit crater during 8-13 June crept down the NW and WNW flanks. Incandescence from the crater was also observed. The Alert Level remained at 1 and the public was reminded not to enter the 6-km-radius Permanent Danger Zone (PDZ). 2011 MAY- 31 JUNE- 15? PHIVOLCS reported that a deformation survey of Mayon conducted in November and December 2010 showed inflation since a survey in 2008. During 18-25 January, up to two daily volcanic earthquakes were detected by the seismic network. Although cloud cover often prevented observations of the summit area, white steam emissions from the crater and nighttime crater incandescence were occasionally observed. The Alert Level remained at 1 and the public was reminded not to enter the 6-km-radius Permanent Danger Zone (PDZ). ABOUT DIENG VOLCANIC COMPLEX ( geological summary by global volcanism program/ USGS): The Dieng plateau in the highlands of central Java is renowned both for the variety of its volcanic scenery and as a sacred area housing Java's oldest Hindu temples, dating back to the 9th century AD. The Dieng volcanic complex consists of two or more stratovolcanoes and more than 20 small craters and cones of Pleistocene-to-Holocene age over a 6 x 14 km area. Prahu stratovolcano was truncated by a large Pleistocene caldera, which was subsequently filled by a series of dissected to youthful cones, lava domes, and craters, many containing lakes. Lava flows cover much of the plateau, but have not occurred in historical time, when activity has been restricted to minor phreatic eruptions. Toxic volcanic gas emission has caused fatalities and is a hazard at several craters. The abundant thermal features that dot the plateau and high heat flow make Dieng a major geothermal prospect. CVGHM reported that on 28 March gas emissions continued to be elevated at Timbang, a cone that is part of the Dieng Volcanic Complex. Plumes containing carbon dioxide drifted 2 km towards the S valley of Kali Sat, prompting a road closure until the early evening when the gas concentration decreased. On 30 March carbon dioxide gas emissions were not detected; however, "smoke" rose at most 100 m above the crater. Hydrogen sulfide odors were very potent in areas 1 km W and weak in areas 1.5 km S. On 19 April sulfur dioxide odors were reported. On 24 March Sileri Crater lake water changed from dark gray to brown. On 7 April white plumes rose 50 m and the water color returned to normal. Diffuse white plumes rose 15 m on 20 April. Other craters had not exhibited any changes by 28 April. Based on gas concentrations, seismicity, and visual observations, CVGHM raised the Alert Level to 3 (on a scale of 1-4) on 8 May and warned the public not to approach Timbang Crater within a 500-m radius. 2013 APR- 02 update/ended APR- 02? 2013 MAR- 07 MAR- 12? 2011 MAY- 22 JUNE- 15? ABOUT MARAPI- Sumatra : ( Geological summary by global volcanism program/ Smithsonian/USGS: Gunung Marapi, not to be confused with the better-known Merapi volcano on Java, is Sumatra's most active volcano. Marapi is a massive complex stratovolcano that rises 2000 m above the Bukittinggi plain in Sumatra's Padang Highlands. A broad summit contains multiple partially overlapping summit craters constructed within the small 1.4-km-wide Bancah caldera. The summit craters are located along an ENE-WSW line, with volcanism migrating to the west. More than 50 eruptions, typically consisting of small-to-moderate explosive activity, have been recorded since the end of the 18th century; no lava flows outside the summit craters have been reported in historical time. 2012 Sep- 28 Oct- 02? 2012 MAY 18 MAY- 22? 2012 MAR- 05 MAR- 20? About IBU by:Smithsonian/ USGS- global volcanism program:The truncated summit of Gunung Ibu stratovolcano along the NW coast of Halmahera Island has large nested summit craters. The inner crater, 1 km wide and 400 m deep, contained several small crater lakes through much of historical time. The outer crater, 1.2 km wide, is breached on the north side, creating a steep-walled valley. A large parasitic cone is located ENE of the summit. A smaller one to the WSW has fed a lava flow down the western flank. A group of maars is located below the northern and western flanks of the volcano. Only a few eruptions have been recorded from Ibu in historical time, the first a small explosive eruption from the summit crater in 1911. An eruption producing a lava dome that eventually covered much of the floor of the inner summit crater began in December 1998. 2013 DEC 07 DEC- 10? 2013 JUNE- 06 JUNE- 11? ABOUT SANGEANG API: (GVP/ Smithsonian institute/ USGSSangeang Api volcano, one of the most active in the Lesser Sunda Islands, forms a small 13-km-wide island off the NE coast of Sumbawa Island. Two large trachybasaltic-to-tranchyandesitic volcanic cones, 1949-m-high Doro Api and 1795-m-high Doro Mantoi, were constructed in the center and on the eastern rim, respectively, of an older, largely obscured caldera. Flank vents occur on the south side of Doro Mantoi and near the northern coast. Intermittent historical eruptions have been recorded since 1512. 2013 JUNE- 18 JUNE- 19? CVGHM reported that during May through 13 June diffuse white plumes rose 10 m above Sangeang Api's crater. Both the lava dome and surrounding areas showed no changes since November 2012. The Alert Level had been increased to 3 (on a scale of 1-4) on 19 May due to a trend of increasing seismicity; as many as 77 shallow earthquakes and 66 deep earthquakes had been detected daily. Residents and tourists were advised to stay away from the craters within a radius of 5 km. Since then seismicity decreased; 15 shallow earthquakes and three deep earthquakes were recorded on 13 June. The Alert Level was lowered to 2 on 14 June. The public were advised not to approach the craters within a radius of 1.5 km. 2013 MAY- 01 MAY- 22? CVGHM reported that during 1-19 May diffuse white plumes rose 10 m above Sangeang Api's crater. Both the lava dome and surrounding areas showed no changes since November 2012. Seismicity had increased on 26 April and remained high. The Alert Level was raised to 3 (on a scale of 1-4) on 19 May. Residents and tourists were advised not to approach the craters within a radius of 5 km. CVGHM reported that during November through mid-December observers at the Sangeang, Bima observation post (50 km SW) noted occasional diffuse white plumes rising 5-15 m above Sangeang Api's crater. The lava dome and surrounding areas had not changed compared to October observations. Avalanches had occurred on the W and SW flanks. Earthquakes had declined. The Alert Level was lowered to 2 (on a scale of 1-4) on 21 December. 2012 OCTOBER 10 OCT- 17? CVGHM reported that during 1-10 October Sangeang Api was often not visible due to fog; occasionally plumes were visible and rose as high as 20 m above the crater. The lava dome and surrounding areas had not changed compared to the beginning of the year. Both the number and magnitude of earthquakes increased on 5 October, declined during 6-8 October, then again increased on 9 October. The Alert Level was raised to 3 (on a scale of 1-4) on 10 October. ABOUT KRAKATAU: (Geological summary be: global volcanism program( Smithsonian institute) : Renowned Krakatau volcano lies in the Sunda Strait between Java and Sumatra. Collapse of the ancestral Krakatau edifice, perhaps in 416 AD, resulted in a 7-km-wide caldera. Remnants of this volcano formed Verlaten and Lang Islands; subsequently Rakata, Danan and Perbuwatan volcanoes were formed, coalescing to create the pre-1883 Krakatau Island. Caldera collapse during the catastrophic 1883 eruption destroyed Danan and Perbuwatan volcanoes, and left only a remnant of Rakata volcano. The post-collapse cone of Anak Krakatau (Child of Krakatau), constructed within the 1883 caldera at a point between the former cones of Danan and Perbuwatan, has been the site of frequent eruptions since 1927. PVMBG reported that during January-8 May diffuse white plumes rose 25-50 m above Anak Krakatau. Seismicity continued to be dominated by shallow and deep volcanic earthquakes, as well as signals indicating emissions. The Alert Level remained at 2 (on a scale of 1-4). Residents and visitors were warned not to approach the volcano within 1 km of the crater. 2012 SEP- 02 SEP- 11? CVGHM reported that during 1 June-1 September observations of Anak Krakatau were often prevented by fog; occasionally diffuse white plumes were observed rising from the crater in June. Seismicity increased significantly in August. On 2 September seismicity again increased, and at 1830 a Strombolian eruption ejected lava 200-300 m above the crater. The Alert Level remained at 2 (on a scale of 1-4). Residents and visitors were warned not to approach the volcano within 1 km of the crater. Based on analyses of satellite imagery, the Darwin VAAC reported that on 3 September ash plumes rose to altitudes of 2.4-4.3 km (8,000-14,000 ft) a.s.l. and drifted 35-95 km N.
2012 JAN- 26 JAN- 31? 2011 SEP- 30 Oct- 11? VGHM reported that seismicity from Anak Krakatau in 2011, as late as 10 July, consisted of 20-30 volcanic-earthquake events per day and shallow events ranged from 120 to 135 events per day. Hundreds of events per day were detected during swarms. On 10 July, the seismic equipment was damaged by Krakatau's activity but was again operational in mid-September. During 18-30 September seismic events reached 4-5 events per minute. Visual observations in 2011 until 13 September indicated occasional explosive eruptions that would eject material and produce ash plumes. During 14-30 September fumarolic activity from the crater and in the fumarolic fields was visible. The Alert Level was increased to 3 (on a scale of 1-4) on 30 September based on an increase in seismic activity and widespread fumarolic activity. A satellite image acquired on 31 July showed a diffuse ash plume rising from Anak Krakatau and drifting W. Geologic Summary. Renowned Krakatau volcano lies in the Sunda Strait between Java and Sumatra. Collapse of the ancestral Krakatau edifice, perhaps in 416 AD, resulted in a 7-km-wide caldera. Remnants of this volcano formed Verlaten and Lang Islands; subsequently Rakata, Danan and Perbuwatan volcanoes were formed, coalescing to create the pre-1883 Krakatau Island. Caldera collapse during the catastrophic 1883 eruption destroyed Danan and Perbuwatan volcanoes, and left only a remnant of Rakata volcano. The post-collapse cone of Anak Krakatau (Child of Krakatau), constructed within the 1883 caldera at a point between the former cones of Danan and Perbuwatan, has been the site of frequent eruptions since 1927. 2011 JAN 12 Jan 18? Based on information from CVGHM, the Darwin VAAC reported that on 12 January an eruption plume from Anak Krakatau rose to an altitude of 2.4 km (8,000 ft) a.s.l. and drifted SE. Meteorological clouds prevented observations of the area from satellite. On 15 January, a pilot observed a plume that rose to an altitude of 3 km (10,000 ft) a.s.l. and drifted 18-28 km E.
Since its desastrous explosion in 1883 Krakatau obviously never became real quiet again and is now said to be one of the most active volcanoes worldwide. In 1927 the volcano which formally exploded in 1883 began to form a new crater above the precious one, which meanwhile became a new island. In 2009, the activity on Krakatau began to increase again to an avarage of 19 small eruption per day in. On OCT- 29 136 eruptions were registered on a new SW crater... find more infos below! Geologic Summary. BATU TARA- by Smithsonian/ USGS- global volcanism program: The small isolated island of Batu Tara in the Flores Sea about 50 km north of Lembata (formerly Lomblen) Island contains a scarp on the eastern side similar to the Sciara del Fuoco of Italy's Stromboli volcano. Vegetation covers the flanks of Batu Tara to within 50 m of the 748-m-high summit. Batu Tara lies north of the main volcanic arc and is noted for its potassic leucite-bearing basanitic and tephritic rocks. The first historical eruption from Batu Tara, during 1847-52, produced explosions and a lava flow. 2014 MAR- 22 APR 01? Based on analyses of satellite imagery and wind data, the Darwin VAAC reported that on 22 March an ash plume from Batu Tara drifted almost 20 km W.
2013 NOV- 05 NOV- 12? Based on analyses of satellite imagery and wind data, the Darwin Volcanic Ash Advisory Centre (VAAC) reported that on 6 November an ash plume from Batu Tara drifted almost 20 km W.
Based on analyses of satellite imagery and wind data, the Darwin Volcanic Ash Advisory Centre (VAAC) reported that during 18-21 September ash plumes from Batu Tara rose to altitudes of 2.1-2.7 km (7,000-9,000 ft) a.s.l. and drifted 35-100 km WSW, W, NW, N, and NE. Based on analyses of satellite imagery and wind data, the Darwin Volcanic Ash Advisory Centre (VAAC) reported that on 16 August an ash plume from Batu Tara rose to an altitude of 1.5 km (5,000 ft) a.s.l. and drifted 130 km W.
2013 JUL- 14 JULY- 16? Based on analyses of satellite imagery and wind data, the Darwin Volcanic Ash Advisory Centre (VAAC) reported that on 14 July an ash plume from Batu Tara rose to an altitude of 2.1 km (7,000 ft) a.s.l. and drifted about 40 km NW. 2013 JAN- 27 FEB- 19? Based on analyses of satellite imagery and wind data, the Darwin Volcanic Ash Advisory Centre (VAAC) reported that during 27-28 January ash plumes from Batu Tara rose to altitudes of 1.8-2.1 km (6,000-7,000 ft) a.s.l. and drifted 37 km NE and E.
2012 DEC- 14 DEC- 19? Based on analyses of satellite imagery and wind data, the Darwin Volcanic Ash Advisory Centre (VAAC) reported that on 14 December ash plumes from Batu Tara rose to an altitude of 2.4 km (8,000 ft) a.s.l. and drifted 75 km NW. Based on analyses of satellite imagery, the Darwin VAAC reported that during 18 and 20-21 May ash plumes from Batu Tara rose to altitudes of 2.4-3 km (8,000-10,000 ft) a.s.l. and drifted 27-55 km N and NW. Based on analyses of satellite imagery, the Darwin VAAC reported that during 25-26 April ash plumes from Batu Tara rose to an altitude of 2.4 km (8,000 ft) a.s.l. and drifted 37 km W and SW. During 30 April-1 May ash plumes again rose to an altitude of 2.4 km (8,000 ft) a.s.l. then drifted 37-55 km NW. Geologic Summary. The small isolated island of Batu Tara in the Flores Sea about 50 km north of Lembata (formerly Lomblen) Island contains a scarp on the eastern side similar to the Sciara del Fuoco of Italy's Stromboli volcano. Vegetation covers the flanks of Batu Tara to within 50 m of the 748-m-high summit. Batu Tara lies north of the main volcanic arc and is noted for its potassic leucite-bearing basanitic and tephritic rocks. The first historical eruption from Batu Tara, during 1847-52, produced explosions and a lava flow. 2011 OCT- 27 Nov- 02? Based on analyses of satellite imagery, the Darwin VAAC reported that on 27 October an ash plume from Batu Tara rose to an altitude of 2.1 km (7,000 ft) a.s.l. and drifted about 45 km W.
2011 SEP- 08 SEP- 27? Based on analyses of satellite imagery, the Darwin VAAC reported that during 21-24 September ash plumes from Batu Tara rose to an altitude of 2.1 km (7,000 ft) a.s.l. and drifted 37-65 km W, WNW, and NW. 2011 AUG- 23 AUG- 30? Based on analyses of satellite imagery, the Darwin VAAC reported that during 23-30 August ash plumes from Batu Tara rose to an altitude of 2.1 km (7,000 ft) a.s.l. and drifted 20-90 km N, NW, and W.
2011 APRIL- 28 July 12? Based on analyses of satellite imagery, the Darwin VAAC reported that during 28 April-3 May ash plumes from Batu Tara rose to an altitude of 3 km (10,000 ft) a.s.l. and drifted 10-130 km N, NW, W, and SW.
2011 MAR- 20 MAR- 21? Based on analyses of satellite imagery, the Darwin VAAC reported that on 20 March an ash plume from Batu Tara rose to an altitude of 2.1 km (7,000 ft) a.s.l. and drifted less than 30 km NE. About IJEN ( geological summary by global volcanism program/ USGS): The Ijen volcano complex consists of a group of small stratovolcanoes constructed within the large 20-km-wide Ijen (Kendeng) caldera. The N caldera wall forms a prominent arcuate ridge, but elsewhere the caldera rim is buried by post-caldera volcanoes, including Gunung Merapi stratovolcano, which forms the 2,799 m high point of the Ijen complex. Immediately W of Gunung Merapi is the renowned historically active Kawah Ijen volcano, which contains a nearly 1-km-wide, turquoise-colored, acid crater lake. The picturesque lake is the site of a labor-intensive sulfur mining operation, in which sulfur-laden baskets are hand-carried from the crater floor. A half dozen small-to-moderate phreatic eruptions have taken place from Kawah Ijen during the 20th century. 2012 JULY- 24 JULY- 24? 2012 MAR- 12 MAR 27? 2012 FEB- 08 FEB 14? 2011 JULY- 10 July- 12? The Darwin VAAC reported that on 10 July a pilot observed an ash plume drifting W from Ijen at an altitude of 3.7 km (12,000 ft) a.s.l. 2014 MAR 10 MAR- 18? CVGHM reported that between 6 September 2009 and July 2011 eruptions from Slamet had been absent and plumes (likely steam) rose as high as 500 m above the crater. Seismicity and the temperature of hot water from springs both decreased. On 11 July, the Alert Level was lowered to 1 (on a scale of 1-4). 2013 OCT- 18 OCT- 29? The Darwin VAAC reported that on 18 October a pilot saw a low-level ash plume from Semeru. Ash was not identified in satellite images. CVGHM reported that during 1-29 February multiple pyroclastic flows from Semeru traveled 500 and 2,500 m into the Besuk Kembar and Besuk Kobokan rivers (on the S flank), respectively. During 1 February-30 April dense gray-to-white plumes rose 100-500 m above Jongring Seloko crater and drifted W and N. Incandescence was visible up to 50 m above the crater during 1 February-31 March. Seismicity decreased from March to April. Observations indicated that the lava dome grew in April. On 2 May CVGHM lowered the Alert Level to 2 (on a scale of 1-4) and reminded the public not to approach the crater within a 4-km radius. 2012 FEB- 03 FEB- 14? On 3 February, CVGHM reported that from 29 December 2011 to 2 February 2012 seismicity increased at Semeru, and dense white and gray plumes rose as high as 600 m above the Jonggring Seloko crater. During the month of January crater incandescence was observed and avalanches carried incandescent material 200-400 m away from the crater. On 2 February a large explosion was reported and incandescent material was ejected 2.5 km from the crater. Based on the seismic activity and visual observations, CVGHM raised the Alert Level from 2 to 3 (on a scale of 1-4) on 2 February. ABOUT RANAKAH- by: Smithsonian Institute/ global volcanism program:A new lava dome, named Anak Ranakah (Child of Ranakah) was formed in 1987 in an area without previous historical eruptions at the base of the large older lava dome of Gunung Ranakah. An arcuate group of lava domes extending westward from Gunung Ranakah occurs on the outer flanks of the poorly known Poco Leok caldera on western Flores Island. 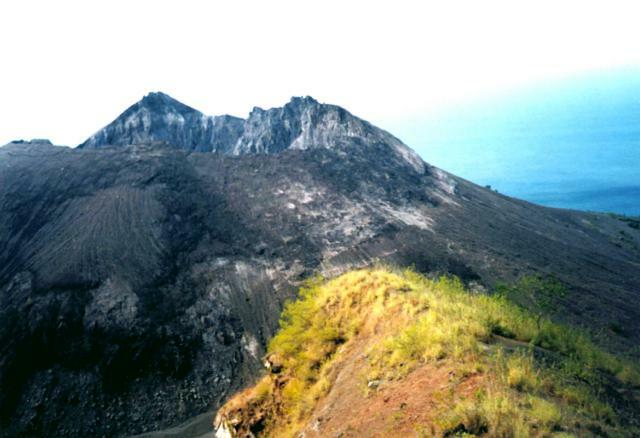 Pocok Mandosawa lava dome, at 2350 m the highest point on the island of Flores, lies west of Anak Ranakah. CVGHM reported that during January-8 April white plumes rose 10-15 m above the Anak Ranakah lava dome and seismicity decreased. On 9 April the Alert Level was lowered to 1 (on a scale of 1-4). 2011 OCT- 19 Oct- 25? CVGHM reported that throughout September and during 1-12 October diffuse white plumes rose 10-15 m above the Anak Ranakah lava dome. Plumes were not observed during 13-21 October. Starting on 1 July, seismicity had increased to a peak level on 15 August then declined through 20 October. Based on visual observations, seismicity, and deformation data, CVGHM lowered the Alert Level to 2 (on a scale of 1-4) on 22 October. 2011 SEP 08 Sep- 13? 2011 JUNE/ AUG AUG- 30? CVGHM reported that observers of Anak Ranakah, a lava dome that formed in 1987 at the base of the large older lava dome of Ranakah, noted white plumes rising up to 10 m high during January-24 August. Seismicity initially increased in December 2010, but increased again during June-August. Based on visual observations and seismic data analyses, CVGHM raised the Alert Level to 2 (on a scale of 1-4). ABOUT TAMBORA- by: Smithsonian Institute/ global volcanism program:The massive Tambora stratovolcano forms the entire 60-km-wide Sanggar Peninsula on northern Sumbawa Island. The largely trachybasaltic-to-trachyandesitic volcano grew to about 4000 m elevation before forming a caldera more than 43,000 years ago. Late-Pleistocene lava flows largely filled the early caldera, after which activity changed to dominantly explosive eruptions during the early Holocene. Tambora was the source of history's largest explosive eruption, in April 1815. Pyroclastic flows reached the sea on all sides of the peninsula, and heavy tephra fall devastated croplands, causing an estimated 60,000 fatalities. The eruption of an estimated more than 150 cu km of tephra formed a 6-km-wide, 1250-m-deep caldera and produced global climatic effects. Minor lava domes and flows have been extruded on the caldera floor at Tambora during the 19th and 20th centuries. 2013 APRIL 05 APR- 09? 2011 active since MAR AUG- 30? ABOUT GALUNGGUNG ( geologic summary by Smithsonian inst./ USGS:The forested slopes of 2,168-m-high Galunggung volcano in western Java are cut by a large horseshoe-shaped caldera breached to the SE that has served to channel the products of recent eruptions in that direction. The "Ten Thousand Hills of Tasikmalaya" dotting the plain below the volcano are debris-avalanche hummocks from the collapse that formed the breached caldera about 4,200 years ago. Although historical eruptions, restricted to the central vent near the caldera headwall, have been infrequent, they have caused much devastation. The first historical eruption in 1822 produced pyroclastic flows and lahars that killed over 4,000 persons. More recently, a strong explosive eruption during 1982-1983 caused severe economic disruption to populated areas near the volcano. 2012 FEB- 13 FEB- 14? About LAMONGAN ( geological summary by global volcanism program/ USGS):Lamongan, a small 1,631-m-high stratovolcano located between the massive Tengger and Iyang-Argapura volcanic complexes, is surrounded by numerous maars and cinder cones. The currently active cone has been constructed 650 m to the SW of Gunung Tarub, the volcano's high point. As many as 27 maars with diameters from 150 to 700 m, some containing crater lakes, surround the volcano, along with about 60 cinder cones and spatter cones. Lake-filled maars, including Ranu Pakis, Ranu Klakah, and Ranu Bedali, are located on the eastern and western flanks; dry maars are predominately located on the northern flanks. None of the Lamongan maars has erupted during historical time, although several of the youthful maars cut drainage channels from Gunung Tarub. Lamongan was very active from the time of its first historical eruption in 1799 through the end of the 19th century, producing frequent explosive eruptions and lava flows from vents on the western side of the volcano ranging from the summit to about 450 m elevation. CVGHM reported that, although weather conditions often prevented observations of Lamongan during 9 March-17 April, white plumes were occasionally seen rising 10-20 m above the crater rim. Seismicity decreased during this period. CVGHM lowered the Alert Level to 1 (on a scale of 1-4) on 19 April. 2012 MAR- 08 ;AR- 20? CVGHM reported that during 1 February-9 March diffuse white plumes rose at most 20 m above Lamongan. Seismicity increased on 23 February, then fluctuated in intensity through 7 March. Seismicity increased significantly on 8 March and tremor was recorded continuously the next day. CVGHM raised the Alert Level to 2 (on a scale of 1-4) on 9 March. Residents and tourists were prohibited from going within a 1-km-radius of the active crater. 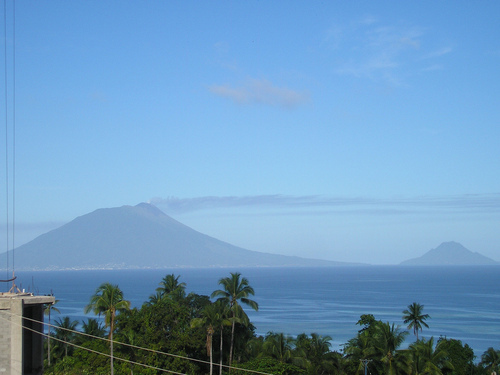 ABOUT GALALAMA: (GVP/ Smithsonian institute/ USGS:Gamalama (Peak of Ternate) is a near-conical stratovolcano that comprises the entire island of Ternate off the western coast of Halmahera and is one of Indonesia's most active volcanoes. The island of Ternate was a major regional center in the Portuguese and Dutch spice trade for several centuries, which contributed to the thorough documentation of Gamalama's historical activity. Three cones, progressively younger to the N, form the summit of Gamalama, which reaches 1,715 m. Several maars and vents define a rift zone, parallel to the Halmahera island arc, that cuts the volcano. Eruptions, recorded frequently since the 16th century, typically originated from the summit craters, although flank eruptions have occurred in 1763, 1770, 1775, and 1962-63. CVGHM reported that eruptions at Gamalama during 15-16 September prompted CVGHM to raise the Alert Level to 3 (on a scale of 1-4) on 16 September. An eruption on 17 September produced a white-and-gray plume that rose 300 m above the crater and drifted E and SE. Ashfall was reported in the ESE part of Ternate (S, SE, and E part of island). After the eruption through 8 October white plumes rose 10-50 m high. Seismicity decreased in early October. The Alert Level was decreased to 2 on 9 October. Visitors and residents were warned not to approach the crater within a radius of 1.5 km. 2012 JANUARY- 24 JAN- 31? 2011 DECEMBER 04 JAN- 03- 2012? According to news articles, at least three people were killed and 1,000-2,600 more from several villages were displaced by lahars from Gamalama during on 27-28 December. The lahars destroyed many homes in the Tubo and Tofure villages and along the Togorara and Marikurubu rivers. The Alert Level remains at 3 (on a scale from 1-4). ABOUT GUNTUR : (Geologic Summary by global volcanism program( Smithsonian inst):Guntur is a complex of several overlapping stratovolcanoes about 10 km NW of the city of Garut in western Java. Young lava flows, the most recent of which was erupted in 1840, are visible on the flanks of the erosionally unmodified Gunung Guntur, which rises about 1,550 m above the plain of Garut. Guntur is one of a group of younger cones constructed to the SW of an older eroded group of volcanoes at the NE end of the complex. Guntur, whose name means "thunder," is the only historically active center, with eruptions having been recorded since the late-17th century. Although Guntur produced frequent explosive eruptions in the 19th century, making it one of the most active volcanoes of western Java, it has not erupted since. 2013 SEP 03 SEP- 04? CVGHM reported that in early March a slight increase of deep and shallow volcanic-tectonic earthquakes at Guntur was recorded; volcanic tremor became continuous on 2 April, prompting CVGHM to raise the Alert Level to 2 (on a scale of 1-4). Temperature measurements of hot springs in five different areas fluctuated until mid-April and then were relatively stable through early May. Seismicity also decreased in early May. On 7 May the Alert Level was lowered to 1. CVGHM reported that on 6, 10, and 12 June, and during 14 June-9 July, the color of the water in Kelimutu’s Crater II (Tiwu Nua Muri Kooh Tai Crater) was bluish white. Diffuse white plumes rose as high as 50 m above the lake’s surface and in some areas the water appeared or sounded like it was boiling. A sulfur odor was also reported. The water in Crater I (Tiwu Ata Polo) was light green and churned, and the water in Crater III (Tiwu Ata Mbupu) was mossy green. During 22-29 June sulfur dioxide concentrations from Crater II were occasionally detected at 2.8 ppm, when the wind blew the gas towards the sensor. CVGHM noted that plumes rising from the lakes became lower and barely visible during 3 June-9 July, and that the “rustling sound” of water from near the dividing wall of craters I and II gradually faded away. Based on visual observations, seismicity, and gas emissions, CVGHM lowered the Alert Level to 1 (on a scale of 1-4) on 12 July. 2013 JUNE- 03 JUNE- 11? ABOUT KELUT : ( Geological summary by globyl volcanism program/ Smithsonian/USGS: The relatively inconspicuous, 1731-m-high Kelut stratovolcano contains a summit crater lake that has been the source of some of Indonesia's most deadly eruptions. A cluster of summit lava domes cut by numerous craters has given the summit a very irregular profile. Satellitic cones and lava domes are also located low on the eastern, western, and SSW flanks. Eruptive activity has in general migrated in a clockwise direction around the summit vent complex. More than 30 eruptions have been recorded from Gunung Kelut since 1000 AD. The ejection of water from the crater lake during Kelut's typically short, but violent eruptions has created pyroclastic flows and lahars that have caused widespread fatalities and destruction. After more than 5000 persons were killed during an eruption in 1919, an ambitious engineering project sought to drain the crater lake. This initial effort lowered the lake by more than 50 m, but the 1951 eruption deepened the crater by 70 m, leaving 50 million cubic meters of water after repair of the damaged drainage tunnels. After more than 200 deaths in the 1966 eruption, a new deeper tunnel was constructed, and the lake's volume before the 1990 eruption was only about 1 million cubic meters. 2014 JAN 01 MAR 04? Geologic Summary. Karangetang (also known as Api Siau) lies at the northern end of the island of Siau, N of Sulawesi, and contains five summit craters strung along a N-S line. One of Indonesia's most active volcanoes, Karangetang has had more than 40 recorded eruptions since 1675. Twentieth-century eruptions have included frequent explosions, sometimes accompanied by pyroclastic flows and lahars. 2014 FEB 09 FEB 11? Based on analyses of satellite imagery and wind data, the Darwin VAAC reported that on 9 February an ash plume from Karangetang rose to an altitude of 4.3 km (14,000 ft) a.s.l. and drifted over 80 km W.
Based on observations from the post in Salili, CVGHM reported that, although Karangetang was sometimes covered in fog during 1 August-2 September, white plumes were seen rising as high as 500 m above the main crater and as high as 300 m above Crater II. Incandescence from the crater was often observed at night. Avalanches began traveling down the Batuawang drainage on 2 September and then intensified the next day. The Alert Level was raised to 3 (on a scale of 1-4) on 3 September. 2013 APR- 09 APR- 09? 2012 DEC- 16 DEC- 18? Based on analyses of satellite imagery and wind data, the Darwin VAAC reported that on 16 December an ash plume from Karangetang rose to an altitude of 3 km (10,000 ft) a.s.l. and drifted 110 km SW.
2012 MAY- 14 MAY 15? 2011 AUG- 08 AUG- 15? CVGHM reported that during July and August cloud cover often prevented observations of Karangetang, although white smoke was sometimes observed rising as high as 500 m above the crater. At night incandescence up to 10 m was often observed. On 8 July a phreatic eruption occurred from the N part of the Main Crater, ejecting material 150 m high. On 24 July and 1 August incandescent material traveled 1,500 m from the Main Crater. Sounds indicating an eruption were heard on 7 August, although fog prevented observations of the crater. Based on recent visual observations and increased seismicity, the Alert Level was raised to 3 (on a scale of 1-4) on 8 August. According to a news article, about 600 people living on the flanks evacuated. CVGHM reported that during 25 March-5 June seismic activity at Karangetang decreased along with the potential threat of avalanches and pyroclastic flows. During 1 May-5 June no pyroclastic flows were observed. Lava flowed 200 m down the flanks and produced incandescent material from the flow fronts that traveled an additional 1.5-1.8 km. Bluish-white emissions rose as high as 500 m from the main crater and incandescence from the crater was observed at night. Lava flow and avalanche activity decreased on 19 May. The Alert Level was lowered to 2 (on a scale of 1-4) on 6 June. Based on analyses of satellite imagery, the Darwin VAAC reported that on 11 March an ash plume from Karangetang rose to an altitude of 2.4 km (8,000 ft) a.s.l. and drifted 55 km SW. According to news reports, lava flows at the summit were visible on 11 March. Blocks originating from the lava dome traveled as far as 2 km down the flanks. Hot gas clouds also descended the flanks. The VAAC also noted that on 13 March an ash plume rose to an altitude of 3.7 km (12,000 ft) a.s.l. and drifted 37 km. ABOUT SINABUNG : ( Geological summary by globyl volcanism program/ Smithsonian/USGS: Gunung Sinabung is a Pleistocene-to-Holocene stratovolcano with many lava flows on its flanks. The migration of summit vents along a N-S line gives the summit crater complex an elongated form. The youngest crater of this conical, 2460-m-high andesitic-to-dacitic volcano is at the southern end of the four overlapping summit craters. An unconfirmed eruption was noted in 1881, and solfataric activity was seen at the summit and upper flanks of Sinabung in 1912. No confirmed historical eruptions were recorded prior to explosive eruptions during August-September 2010 that produced ash plumes to 5 km above the summit. 2014 FEB 08 APRIL 22? Based on reports from PVMBG, BNPB reported on 8 and 9 February that seismicity at Sinabung continued to be dominated by hybrid earthquakes, indicating pressure below the crater and a growing lava dome. Earthquakes associated with avalanches increased. The 9 February report noted that the number of displaced people reached 32,351 (9,991 families) in 42 evacuation centers. Refugees from 17 villages outside the 5-km radius were allowed to return to their homes, starting with four villages during the first phase. PVMBG reported that observers in Ndokum Siroga, about 8.5 km away, noted gray plumes rising 1 km above Sinabung on 6 December. Grayish-white plumes rose as high as 400 m on 7 December, and dense white plumes also rose as high as 400 m the next day. Dense grayish-to-white plumes rose 70-200 m on 9 December. White plumes rose 100-150 m above the crater during 10-13 December. Tremor during 6-13 December was recorded continuously, with varying amplitude. The number of low-frequency earthquakes significantly increased on 7 December, and the number of hybrid earthquakes increased the next day. RSAM values had steadily increased since 28 November. The Alert Level remained at 4 (on a scale of 1-4). PVMBG reported that after 29 September, the day the Alert Level was lowered to 2 (on a scale of 1-4), seismicity at Sinabung declined but continued to fluctuate through 22 October. White plumes were seen rising 100-300 m from the crater. On 22 October plumes were also grayish and rose 250 m. Vents appeared on the N flank and produced dense white plumes that rose 70 m. On 23 October landslides at two locations were observed, and explosions occurred at 1619 and 1651. Plumes rose from the summit crater and from a fracture formed on 15 October near Lau Kawar. Fog prevented observations for a period after the explosions; once the fog cleared dense gray plumes were observed. A third explosion occurred at 2100. On 24 October an explosion at 0550 generated an ash plume that rose 3 km and caused ashfall in areas S. Another explosion was detected at 0612. According to a news article about 3,300 people that evacuated their homes were mostly from two villages within 3 km of Sinabung, in the Karo district. Based on information from the Indonesian Meteorological Office, the Darwin VAAC reported that an eruption at 1737 on 26 October generated an ash plume that rose to an altitude of 4.9 km (16,000 ft) a.s.l. At 0700 and 1200 on 27 October a webcam showed an ash plume rising to an altitude of 3.7 km (12,000 ft) a.s.l. and drifting over 35 km NE. (volcano-discovery- 20101025) A new phase of explosive eruptions began Wednesday afternoon at around 16:20 local time and intensified yesterday morning between 6 and 8 am. An ash plume rose about 3 km from the volcano. CVGHM reported that seismicity at Sinabung fluctuated in 2012-2013, including during July-September 2013. During 1-14 September dense white plumes rose 100-150 m above the crater, and at 0255 on 14 September incandescence from the crater was observed. According to news articles an eruption at 0245 on 15 September produced an ash plume and ashfall in Sukameriah (50 km NE), Kutarayat, Kutagugung (16 km SW), and Berastagi (14 km E). About 3,000 people evacuated from areas within a 3-km radius of the volcano, and several flights at Medan's airport (55 km NW) were canceled. CVGHM raised the Alert Level to 3 (on a scale of 1-4). An eruption at 1203 on 17 September ejected tephra and a dense ash plume that rose higher than the plume from 15 September. According to the Darwin VAAC, a pilot observed an ash plume that rose to an altitude of 6.1 km (20,000 ft) a.s.l. and drifted 55 km SE. On 18 September a low-level ash plume rose to an altitude of 3 km (10,000 ft) a.s.l. and drifted SE. Geologic Summary. PALUWEH - by Smithsonian/ USGS- global volcanism program:Paluweh volcano, also known as Rokatenda, forms the 8-km-wide island of Paluweh N of the volcanic arc that cuts across Flores Island. Although the volcano rises about 3,000 m above the sea floor, its summit reaches only 875 m above sea level. The broad irregular summit region contains overlapping craters up to 900 m wide and several lava domes. Several flank vents occur along a NW-trending fissure. The largest historical eruption of Paluweh occurred in 1928, when a strong explosive eruption was accompanied by landslide-induced tsunamis and lava-dome emplacement. 2013 AUG- 10 AUG- 13? According to news articles, a partial lava-dome collapse at Paluweh on 10 August generated a pyroclastic flow that traveled N towards a beach village and killed at least 5 people. A volcanologist at the monitoring post for Paluweh noted that the eruption lasted seven minutes, and that the pyroclastic flow burned trees around the beach and villages, making it difficult to reach the victims. Pyroclastic flows continued to be reported hours after the initial eruption. Based on analyses of satellite imagery and wind data, the Darwin VAAC reported that an ash plume rose to an altitude of 4.3 km (14,000 ft) a.s.l. and drifted 130 km W. News sources noted that a mandatory evacuation order had caused some residents to evacuate prior to the eruption on 10 August, but nearly10,000 still remained on the island. After the eruption, a rescue team was sent to evacuate about 2,000 people that remained inside a 3-km exclusion zone. A team member noted that rescuing people was difficult since they were reluctant to leave their livestock and homes, but also that the ground was hot and covered in 10-20 cm of ash. The VAAC reported that during 11-12 August ash plumes rose to an altitude of 1.8 km (6,000 ft) a.s.l. and drifted 110-130 km W. A news article noted that the eruptions were smaller on 12 August, but pyroclastic flows continued to be observed. The Alert Level remained at 3 (on a scale of 0-4). 2013 JUNE- 19 JUNE- 25? Based on analyses of satellite imagery and wind data, the Darwin VAAC reported that on 19 June ash plumes from Paluweh rose to an altitude of 2.4 km (8,000 ft) a.s.l. and drifted over 35 km SE. 2013 MAY- 21 MAY- 29? Based on analyses of satellite imagery and wind data, the Darwin VAAC reported that during 21-22 and 24 May ash plumes from Paluweh rose to altitudes of 2.1-3 km (7,000-10,000 ft) a.s.l. and drifted 25-55 km NW, W, and E.
2013 MAR- 09 MAY- 14? CVGHM reported that activity at Paluweh during October 2012-January 2013 was characterized by lava-dome growth, incandescent avalanches, pyroclastic flows, ash plumes that rose as high as 4 km above the dome, and ejected material deposited 3 km away. The whole island was affected by ashfall, which was an average of 2 cm thick on some areas. Some infrastructure and several homes were damaged by ash and lahars. 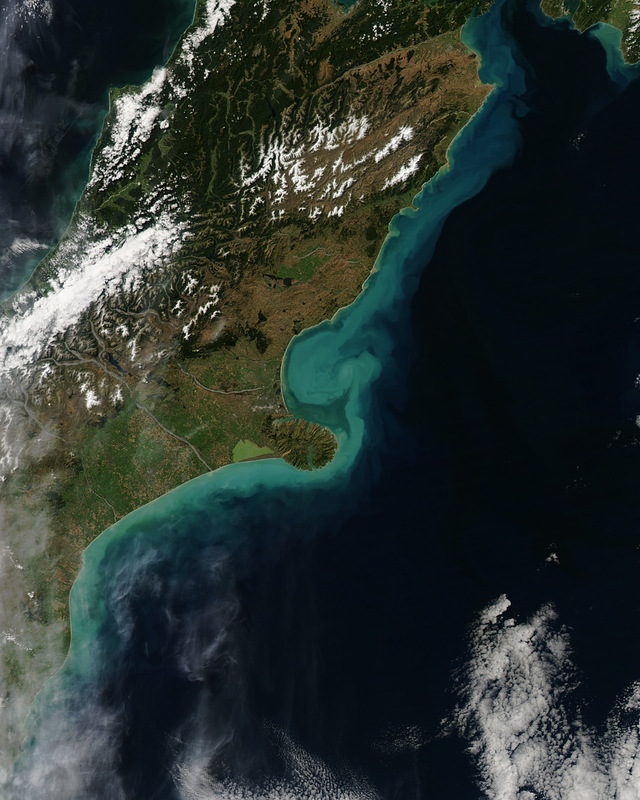 On 1 February at 1652 an eruption generated an ash plume that rose 2 km. Pyroclastic flows and avalanches were observed. On 2 February an explosion produced an ash plume that rose 4 km and was accompanied by booms and rumbling. The ash plume drifted S and deposited ashfall up to 1 mm thick in Ende (60 km S); thick ashfall was reported in Ona (SE part of the island) and thin deposits were reported in other areas of the island to the W, N, and E. About 25% of the S portion of the dome was lost; the lava-dome volume was an estimated 5.1 million cubic meters on 13 January. On 3 February an ash eruption was observed as well as incandescence from the crater. During 4-10 February diffuse white plumes rose 50-100 m. The Alert Level remained at 3 (on a scale of 1-4), and visitors and residents were prohibited from approaching the crater within a 3-km-radius. According to news articles, an explosion from Paluweh occurred at 2300 on 2 February and was clearly heard by local residents. Authorities evacuated by boat all residents from the eight villages on the island. Ashfall was reported during 2-3 February. Based on analyses of satellite imagery, wind data, and pilot reports, the Darwin VAAC reported that on 3 February ash plumes from Paluweh rose to altitudes of 13.1-13.7 km (43,000-45,000 ft) a.s.l. and drifted 325-590 km SE, S, and SW. Elevated levels of sulfur dioxide were also detected. The next day ash plumes at an altitude of 7.6 km (25,000 ft) a.s.l. were observed. Based on analyses of satellite imagery and wind data, the Darwin VAAC reported that on 29 January ash plumes from Paluweh rose to an altitude of 1.8 km (6,000 ft) a.s.l. and drifted less than 20 km ENE. 2013 JAN- 04 JAN- 08? Based on analyses of satellite imagery and wind data, the Darwin VAAC reported that on 4 January ash plumes from Paluweh rose to an altitude of 3.7 km (12,000 ft) a.s.l. and drifted 37 km NE. On 7 January an ash plume rose to an altitude of 3 km (10,000 ft) a.s.l. and drifted less than 20 km NE. 2012 DEC- 12 DEC- 24? Based on analyses of satellite imagery and wind data, the Darwin VAAC reported that during 14-15 December ash plumes from Paluweh rose to an altitude of 3 km (10,000 ft) a.s.l. and drifted 35-65 km NW and W. On 17 December an ash plume rose to an altitude of 1.5 km (5,000 ft) a.s.l. and drifted 55 km E. The next day an ash plume drifted 55 km E at altitudes of 3.4-3.7 km (11,000-12,000 ft) a.s.l. Based on seismic data and visual observations, CVGHM raised the Alert Level for Paluweh from 2 to 3 (on a scale of 1-4) on 13 October. The Alert Level had been raised to 2 five days earlier. 2012 OCT- 08 OCT- 17? 2012 SEP- 11 Sep- 11? CVGHM reported that on 7 September the Alert Level for Paluweh was lowered from 2 to 1 (on a scale of 1-4). 2012 JAN- 19 JAN- 31? 2011 JUNE- 17 JUNE- 23? ABOUT SOPOTAN : ( Geological summary by globyl volcanism program/ Smithsonian/USGS: The small conical volcano of Soputan on the southern rim of the Quaternary Tondano caldera is one of Sulawesi's most active volcanoes. During historical time the locus of eruptions has included both the summit crater and Aeseput, a prominent NE-flank vent that formed in 1906 and was the source of intermittent major lava flows until 1924. On 14 June CVGHM reported that, after the Alert Level at Soputan was raised to 3 (on a scale of 1-4) on 19 April due to a trend of increased seismicity, the number of various types of earthquakes decreased, except for events signaling avalanches, which fluctuated during the period. No changes were observed in emissions; white plumes continued to rise at most 50 m above the crater. On 14 June the Alert Level was lowered to 2. Residents and tourists were advised not to approach the craters within a radius of 4 km. CVGHM reported that seismicity at Soputan decreased during 1-26 November. The Alert Level was lowered to 2 (on a scale of 1-4) on 27 November. 2012 SEP- 18 SEP- 25? CVGHM reported that the Alert Level for Soputan had been lowered to 2 (on a scale of 1-4) on 26 June. Seismicity increased during 8-22 August; on 23 August volcanic earthquakes and avalanches significantly increased. White plumes rose 50-150 m above the crater. An eruption at 1936 on 26 August ejected incandescent tephra 50 m above the crater and produced a plume that rose 1 km and drifted W. The Alert Level was raised to 3. Based on information from CVGHM, NOAA, and analysis of satellite imagery, the Darwin VAAC reported that on 27 August an ash plume rose to an altitude of 12.1 km (40,000 ft) a.s.l. and drifted 150 km W. The eruption lasted four hours. Later, a plume detected in satellite imagery rose to an altitude of 6.1 km (20,000 ft) a.s.l. On 28 August an ash plume drifted 220 km SW at an altitude of 6.1 km (20,000 ft) a.s.l. 2012 AUGUST- 14 Aug- 14? According to NASA's Earth Observatory, a satellite image acquired on 8 August showed a small volcanic plume rising from Soputan. 2012 MAY- 28 MAY 29? CVGHM reported that observers in the village of Maliku noted that during 21-27 May white plumes rose 50-150 m above the crater of Soputan. Seismicity increased significantly on 25 May. CVGHM raised the Alert Level to 3 (on a scale of 1-4) on 28 May based on visual observations and increased seismicity. 2011 AUG- 14 ongoing in intervals? CVGHM reported that during 19 July-13 August white plumes from Soputan's summit crater rose 50-150 m. Seismicity fluctuated, but declined overall until 10 August. On 14 August a gray-and-white eruption plume rose 1 km above the crater. Throughout the day, two more similar plumes rose 1.3 km above the crater. Based on analysis of satellite imagery, the Darwin VAAC reported that an ash plume drifted more than 100 km W. The Alert Level was raised to 3 (on a scale of 1-4). Visitors and residents were prohibited from going within a 6-km radius of the crater. 2011 JULY- 20? JULY- 26? CVGHM reported that on 3 July an explosion of incandescent material from Soputan was followed by a 6-km-high ash plume and a pyroclastic flow that traveled as far as 4 km W. Later that day a dense white plume rose 50 m above the crater. On 20 July CVGHM noted that since 4 July seismicity had decreased and only diffuse white plumes rose 75 m above the crater until 18 July. The Alert Level was lowered to 2 (on a scale of 1-4) on 19 July. Visitors and residents were prohibited from going within a 4-km radius of the crater. CVGHM reported that during June diffuse white plumes from Soputan rose 25-150 m. During 21 June-2 July seismicity increased, and on 2 July the Alert Level was raised to 3 (on a scale of 1-4). Visitors and residents were discouraged from going within a 6-km radius of the crater and climbing the volcano was prohibited. According to news articles, a CVGHM volcanologist reported that a Strombolian eruption that began on 3 July produced an ash plume that rose 6 km and drifted W. Ashfall impacted villages, trees, and vegetation downwind. Sam Ratulangi International airport in the capital of Manado was closed for three hours. Articles also stated that the Red Cross distributed about 31,000 masks to area residents. ABOUT SEULAWAH AGAM : ( Geological summary by global volcanism program/ Smithsonian/USGS: CVGHM reported that during October 2010-July 2011 activity at Seulawah Agam decreased. Measurements indicated that seismicity decreased, water temperature decreased and pH levels were stable, gas emissions were lower, and no significant surface changes were observed. The Alert Level was lowered to 1 (on a scale of 1-4) on 11 July. ABOUT LEWOTOBI - by: Smithsonian Institute/ global volcanism program: The Lewotobi "husband and wife" twin volcano (also known as Lewetobi) in eastern Flores Island is composed of the Lewotobi Lakilaki and Lewotobi Perempuan stratovolcanoes. Their summits are less than 2 km apart along a NW-SE line. The conical 1,584-m-high Lewotobi Lakilaki has been frequently active during the 19th and 20th centuries, while the taller and broader 1,703-m-high Lewotobi Perempuan has erupted only twice in historical time. Small lava domes have grown during the 20th century in the crescentic summit craters of both volcanoes, which are open to the N. A prominent flank cone, Iliwokar, occurs on the E flank of Lewotobi Perampuan. CVGHM reported that seismicity at Lewotobi Lakilaki, one of two stratovolcanoes comprising Lewotobi, fluctuated but declined overall during 18 September 2011-25 March 2012. No significant changes were observed at the volcano. The Alert Level was lowered to 1 (on a scale of 1-4) on 29 March. Observers of Lewotobi Perempuan, the second stratovolcano comprising Lewotobi, noted that during January-March diffuse white plumes rose 15 m above the crater and no significant changes had occurred. After 31 August 2011 through 25 March 2012 seismicity fluctuated but declined overall. On 29 March the Alert Level was lowered to 1. About SUNDORO (geologic summary by global volcanism program( Smithsonian institute): Gunung Sundoro, one Java's most symmetrical volcanoes, is separated by a 1400-m-high saddle from Sumbing volcano. Parasitic craters and cones, the largest of which is Kembang, occur on the NW-to-southern flanks, and all fed lava flows. A small lava dome occupies the summit crater of the 3136-m-high volcano, and numerous phreatic explosion vents were formed along radial fissure that cut the dome and extend across the crater rim. Lava flows extend in all directions from the summit crater. Deposits of a large prehistoric debris avalanche are located below the NE flank of Sundoro. Pyroclastic-flow deposits dated at 1720 years before present extend as far as 13 km from the summit. Historical eruptions typically have consisted of mild-to-moderate phreatic explosions, mostly from the summit crater. Flank vents were also active in 1882 and 1903. CVGHM reported increased seismic activity at Sundoro during October -4 December. On 26 November and 2 December smoke was reported from many fumaroles around the summit crater. Based on visual and seismic data, CVGHM raised the Alert Level from 1 to 2 (on a scale of 1-4) on 5 December. ABOUT LEWUTOLO: (GVP/ Smithsonian institute/ USGS: Anchoring the eastern end of an elongated peninsula that is connected to Lomblen Island by a narrow isthmus and extends northward into the Flores Sea, Lewotolo rises to 1,423 m. Lewotolo is a symmetrical stratovolcano as viewed from the N and E. A small cone with a 130-m-wide crater constructed at the SE side of a larger crater forms the volcano's high point. Many lava flows have reached the coastline. Historical eruptions, recorded since 1660, have consisted of explosive activity from the summit crater. 2011 JANUARY 25 JAN- 31? 2011 DECEMBER 31 Jan- 11- 2012? CVGHM reported that white plumes rose 50-250 m above the summit of Lewotolo during the month of December. Seismicity increased on 31 December and intensified on 2 January, the same day incandescence was observed. Based on visual and seismic observations, CVGHM raised the Alert Level from 1 to 2 (on a scale of 1-4) on 2 January, then later that day raised the Alert Level to 3. About SIRUNG ( geological summary by global volcanism program/ USGS): Sirung volcano is located at the NE end of a 14-km-long line of volcanic centers that form a peninsula at the southern end of Pantar Island. The low, 862-m-high volcano is truncated by a 2-km-wide caldera whose floor often contains one or more small lakes. Much of the volcano is constructed of basaltic lava flows, and the Gunung Sirung lava dome forms the high point on the caldera's western rim. A number of phreatic eruptions have occurred from vents within the caldera during the 20th century. Forested Gunung Topaki, the 1390-m high point of the volcanic chain, lies at the SW end and contains a symmetrical summit crater. CVGHM reported that on 8 May a three-hour long ash eruption from Sirung was accompanied by loud sounds and incandescence that reached 10 m above the crater. An ash plume rose 3.5 km above the crater and drifted N, producing ashfall up to 4 mm thick near the crater. During 9-12 May white plumes rose 30-50 m above the crater. A sulfur odor was reported in areas up to 3 km away on 12 May. That same day CVGHM raised the Alert Level to 3 (on a scale of 1-4) and recommended that visitors not approach the volcano within a 2.5 km radius. Based on a report from a ground-based observer and analyses of satellite imagery, the Darwin VAAC noted that on 12 May an ash plume rose to an altitude of 3 km (10,000 ft) a.s.l. and drifted about 95 km SW.
ABOUT TENGGER CALDERA ( geological summary by global volcanism program/ USGS): The 16-km-wide Tengger caldera in eastern Java is located at the northern end of a volcanic massif extending from Semeru volcano. The massive Tengger volcanic complex consists of five overlapping stratovolcanoes, each truncated by a caldera. The most recent is the 9 x 10 km wide Sandsea caldera, which formed incrementally during the late Pleistocene and early Holocene. An overlapping cluster of post-caldera cones was constructed on the floor of the Sandsea caldera within the past several thousand years. The youngest of these is Bromo, one of Java's most frequently visited and most active volcanoes. More than 50 mild-to-moderate explosive eruptions have occurred since 1804. 2012 OCT 01 Oct- 09? CVGHM reported that on 10 March ash from Tengger Caldera's Bromo cone fell in areas to the E and NE, including in the Probolinggo district (35 km NE). During 18-20 March gray-to-brown ash plumes rose 400-800 m above the crater and drifted SE. Incandescent material was ejected 300 m above the crater and landed up to 500 m away. Roaring and booming noises were also noted. The Alert Level remained at 3 (on a scale of 1-4). Residents and tourists were not permitted within a 2-km radius of the active crater. Based on analyses of satellite imagery and information from CVGHM, the Darwin VAAC reported that during 18-20 March ash plumes rose to an altitude of 3 km (10,000 ft) a.s.l. and drifted 27-150 km NW, SW, and S.
CVGHM reported that during 8-9 February gray-to-brown ash plumes from Tengger Caldera's Bromo cone rose 400-800 m above the crater and drifted E. Incandescent material was ejected 300 m above the crater and landed as far as 500 m away, and roaring and booming was heard. Ash fell at the Bromo observation post on 8 February. The Alert Level remained at 3 (on a scale of 1-4). Residents and tourists were not permitted within a 2-km-radius of the active crater. GHM reported that during 17-18 February brownish gray ash plumes from Tengger Caldera's Bromo cone rose 400-800 m above the crater and drifted ENE. Incandescent material was ejected 300 m above the crater and landed as far as 500 m away, and roaring and booming was heard. The Alert Level remained at 3 (on a scale of 1-4). Residents and tourists were not permitted within a 2-km-radius of the active crater. ABOUT EBULOBO : (Geologic Summary by global volcanism program( Smithsonian inst):Ebulobo, also referred to as Amburombu or Keo Peak, is a symmetrical stratovolcano in central Flores Island. The summit of 2124-m-high Gunung Ebulobo cosists of a flat-topped lava dome. The 250-m-wide summit crater of the steep-sided volcano is breached on three sides. The Watu Keli lava flow traveled from the northern breach to 4 km from the summit in 1830, the first of only four recorded historical eruptions of the volcano. 2013 AUG 21 AUG- 26? CVGHM reported that observers at Ebulobo's observation post in Ekowolo (Boa Wae District) noted that during August white plumes rose as high as 30 m. Volcanic tremor was detected starting on 10 August. At night during 21-23 August incandescence was visible on the N side of the summit (incandescence was last observed in 2011). The Alert Level was raised to 2 (on a scale of 0-4) on 23 August. Residents and tourists were not permitted within a 1.5-km-radius of the crater.